Sideways is such an excellent movie. 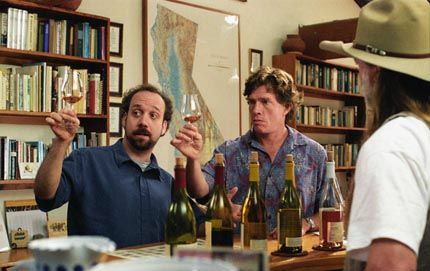 You actually end up learning a lot about wine, but I enjoy the film because Paul Giamatti’s character is essentially an older version of a close friend of mine. I’m pretty sure he doesn’t read this blog. Plus writer/director Alexander Payne is a UCLA alum and the whole movie was filmed on location in the California wine country. Nice. The Cokemachineglow Halfstravaganza should be up any minute, but while you’re waiting we put together two excellent podcasts of the staff’s favorite music of the year. Check ’em out.